Powerful, effective protection against online threats. Active scanning quickly removes malware and prevents new infections in real-time. Hourly virus definition updates make sure the very latest infections are targeted. Improved smart web filter blocks malicious web sites from stealing your information. STOPzilla AntiVirus 8.0 detects viruses and malware in real-time before it is even saved to the hard drive. Preventative, faster detection than previous versions gives you the best antivirus protection possible. Many viruses and malware threats are designed to interfere with the operation of AntiVirus/AntiMalware products. 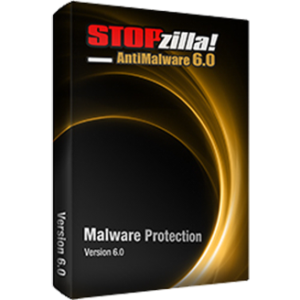 STOPzilla AntiVirus 8.0 is designed to thwart this type of interference allowing the product to provide uninterrupted protection. Our smart Web Filter is a cloud based URL scanning utility that is updated with newly discovered threats every 5 seconds, protecting you from malicious websites that steal end-user information. STOPzilla AntiVirus quickly and easily removes any threats with our Quick, Full, Custom or Scheduled scans. Also removes threats through Active Protection. STOPzilla AntiVirus 8.0 is a smart anti-virus software that has the ability to detect even the most potent rootkits and make sure your files and data always stay protected from malicious intrusions. STOPzilla AntiVirus allows end-to-end scans of removable media like USB drives and external drives. STOPZilla AntiVirus has built-in optimization algorithms that enable it to save file metadata during initial scans. Subsequent scans are able to run more quickly, as information about previously scanned files is stored in a cache for quicker retrieval and analysis. For the gaming enthusiasts, Gaming Mode ensures that STOPzilla AntiVirus does not interfere while a user is busy focused on their favorite games. STOPzilla Antivirus 7.0 is a comprehensive Antivirus solution for Windows Vista, 7, 8, and 10 operating systems.